One year ago, we thought that we would be home by now. We were wondering how we would do Passover in China. We picked out names. We asked our friend (and rabbi) Shana if she would do the baby naming. One year ago it was inconceivable that we would still be waiting. But here we are. I wish we had good news to share. But we don't. It has been a rough couple of weeks. We officially hit the one year mark in our wait last week (yes, I bought a new DVD - Peter Pan...a bit of trivia about it - Mara played Wendy (along with a bunch of other girls) in her kindergarten production of Peter Pan...really). Judging from the size of the last referral batch (only 2 days of LIDs were referred) and the supposed numbers of LIDs in the rest of October and November (HUGE numbers in those months), many are predicting that it could take until the end of this year to get through the backlog of 2005 LIDs. Remember, our LID is 4-17-06. Where does this put us? Well...realistically, we are hopeful that we will be able to travel before the Olympics. Of course, if we have to travel next summer, part of me really hopes that we will be able to see some of the Olympics while we're there. Most agencies say that the wait will soon extend to 24-30 months; I am hopeful that we will wait less than 3 years, but a 3 year wait is certainly a possibility. We also have a better idea today of where we are in the process. We are now positive that we are NOT out of review. Without going into too much detail, our agency was asked for an updated copy of our I171-H (INS approval) yesterday. They say that their China contact called CCAA to ask about another client's file, and was given a heads-up about the typo on our form. We got the form fixed back in February, so there was a short turn-around time, and we're hopeful that this won't delay our referral even further. They say that this wasn't an official question, but I am feeling very cynical that they're just covering their own behinds (since they didn't catch the mistake in the first place, then didn't send the updated form last month). Chris is far more optimistic (yes, I know it's strange for him to be the cheerful one) that the woman in China actually did us a huge favor so that we could get the corrected form there before we're actually being reviewed. Who knows. But we do know that we are far from being through review. On a MUCH happier note, Aunt Marf (Chris's sister Martha) has already begun to spoil her niece. For my birthday, Martha knitted me (ok, not me, our daughter) moose booties. If you don't know, I LOVE moose, and these are too cute! We have also had quite the week in sports. We went to the Red Sox-Orioles game last night in Baltimore. The game rocked as the Sox won 6-1. Saturday we went with our good friends Jim & Bridget to see roller derby. Not the movie (seriously, how many people will ask me that? ), but real live roller derby. It was stranger than you could imagine, but really a lot of fun. If I didn't bruise like a peach, I would so want to try it! And Sunday night we had our first softball games of the season. 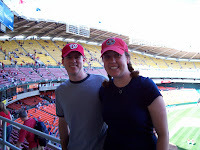 We lost both, but it was so much fun to play again (and fun, too, to go out afterwards with the team and watch the Red Sox hit back-to-back-to-back-to-back home runs!). So, there is at least one piece of good news this weekend - baseball season is upon us. And in a couple of days, we'll get to see Dice-K pitch to Ichiro at Fenway. Set your tivos now. Baseball was kind enough to give me opening day for my birthday, and Chris and I spent the afternoon watching the Nats get crushed. The upside was that it was in the 70s, we got to see Dontrelle Willis pitch, and we had a bet going with the guys in our section about whether or not the guy in the Teddy Roosevelt costume would get seriously hurt ziplining off the roof of RFK. Really. The other exciting news is that I recently launched my own store, selling baseball & Red Sox themed shirts for kids. It's called Baseball Baby, and is at http://www.cafepress.com/baseballbaby. Tell your friends! Ok, so enough good news...there's little to celebrate coming out of China. The run-down...April is not through review, nor do I think we'll be through any time soon. While it is entirely possible that our dossier has been reviewed, we won't know for sure until the CCAA updates their site. And at least one person from April was asked questions this week. So no sigh of relief there. There is word that referrals have either landed at some agencies or are about to land any day now. This is great news for the people included...the horrible news is how few people appear to be included. This isn't official yet, but it appears that this batch goes through October 26, 2005 - an underwhelming 2 days of referrals. Part of the small size can be attributed to Chinese New Year (remember, everything was closed for 2 weeks), but I can't even begin to explain the rest (nor am I in the mood to right now). The bottom line is that since we submitted our application over a year ago, the CCAA has gotten through just under 5 months of log-in dates. At this rate, there is the distinct possibility that we will be in China for the Olympics. Really.